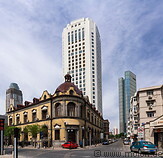 South of the central train station, across the river is an area with many colonial era buildings. These buildings were built at the end of the 19th century by the then occupying powers (England, France and others). The buildings are in a very good conservation status. At night the waterfront opposite the train station is nicely illuminated. The century clock is near the central train station. Built at the turn of the century, it is almost 40m high and weighs 170 tons.